1. To make your sauce (this can be done ahead of time), place the arrowroot in a small cup with a bit of the water and whisk together until it is smooth. 2. In a medium saucepan, place remaining water, juice, maple syrup, soy sauce, ginger, garlic, molasses, oil and optional zest. Cook over medium-low heat, stirring often, for about 5 minutes. 3. Increase the heat to medium-high and whisk in the arrowroot mixture. Continue to cook just until it is heated through and slightly thickened. Set aside until needed. 4. Begin by cooking the quinoa: In a medium saucepan, heat on medium. Add quinoa and lightly toast until fragrant. Add in water, bring to a boil and simmer, covered, for 15-20 minutes until the water is absorbed. Fluff with a fork and return lid to pot to steam. Set aside until needed. 5. Preheat oven to 400F. 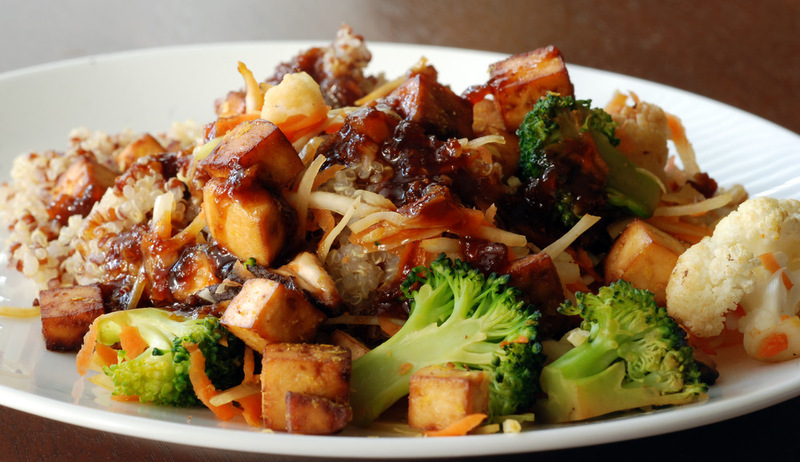 Place pressed and cut tofu in a 9 x 13 pan lined by a silpat, toss with soy sauce and toasted sesame oil. Spread tofu in a single layer. Bake for 10 minutes, turn over and continue to bake for another 10 minutes, until browned. Toss the tofu cubes with the nutritional yeast (if using), and set aside. 6. In a medium skillet, heat the broth with the soy sauce over medium-high heat. Add the shiitake mushrooms and broccoli and saute for 5 minutes until the broccoli is a brilliant green and tender crisp. Toss in the cabbage and carrots and cook for an additional minute, stirring often. 7. 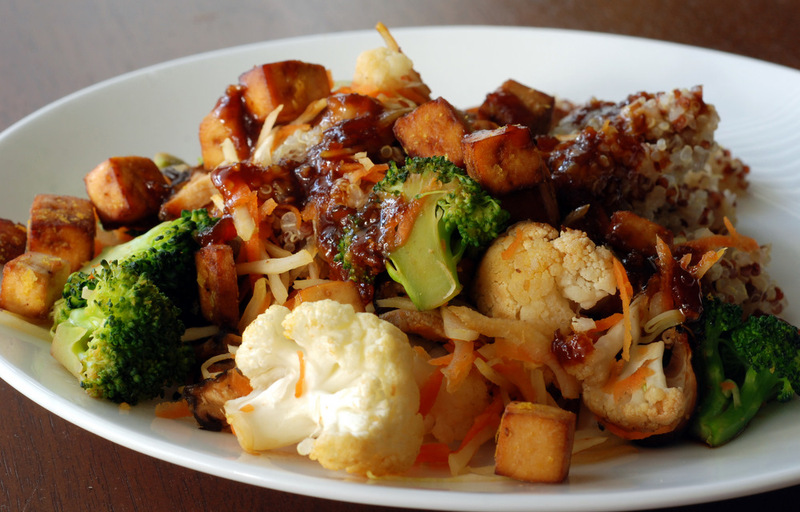 To serve, Place the quinoa in a bowl, top with the veggies then the tofu and drizzle with the sauce. Sprinkle with sesame seeds. Ooh this is the sauce I was eating all last week. Definitely delicious. Mmmm…this looks SO satisfying and tasty 🙂 A must try! I need more go-to sauces for when my nights get busy also. Sometimes creating a whole meal after getting home from work and the gym seems impossible! but recipes like this would make it SO much easier. This looks really fresh and delicious, Janet. Thanks for joining in WHB #321. Cheers! Hi Janet! You have an amazing blog with many unique and intriguing recipes! Glad to have found your space. I made this a couple of days ago and had it with noodles instead of quinoa but kept everything else pretty much the same apart from using date paste instead of maple syrup. It was gorgeous and reminded me of a takeaway I used to get. It made a nice big batch so I have some portions in my freezer too. Many thanks!